Upbeat Christmas songs from the traditional to the satirical, with some great originals. Some sweet, some naughty, Jimmi Accardi with other artists he produced, recorded with, or wrote songs with. Downloads here, CDs at Molehill link below left. 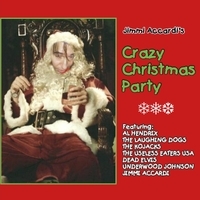 A compilation of Christmas songs from various artists Jimmi Accardi produced, recorded with, and/or co-wrote songs with. Humorous parodies, interesting originals, creative versions of classics. Artists include Al Hendrix, The Useless Eaters USA, The Laughing Dogs, The Dead Elvis, Underwood Johnson, The Kojacks.